Bill put on his shirt. His tangerine shirt. Bill went to the dressing table. Bill opened the top drawer. Bill took out his cufflinks. His gold cufflinks. Bill closed the drawer. Bill did up the cuffs of his shirt. His tangerine shirt. Bill went to the wardrobe. Bill opened the doors. Bill took out his suit. His freshly cleaned grey herringbone suit. Bill left the wardrobe doors open. Bill walked over to the bed. Bill laid out the suit on top of the bed covers. Bill took the trousers from the coat hanger. Bill put on the trousers of his suit. His freshly cleaned grey herringbone suit. Bill went back to the dressing table. Bill opened the second drawer of the dressing table. Bill took out a tie. The red tie his daughters had once given him for Christmas. The red tie he had worn ever since. Bill closed the drawer. Bill walked back to the wardrobe. 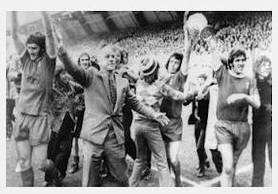 observations: I remember where I was when Bill Shankly announced his retirement from Liverpool Football Club in 1974 (which is what is about to happen above). I remember where I was when he died in 1981 – I was a journalist, and I gave the first report of his death, interrupting a radio programme to give a newsflash ‘before the pennies were on his eyes’ my boss said. And I remember where he lived – round the corner from my flat, in a very un-flash semi-detached Liverpool house. If I didn’t remember those things, I can't decide how interesting I would find this novel – which relates how Shankly managed Liverpool FC throughout the 1960s and early 70s, leading them to great success, and becoming a legend in the process. But as it is, I loved it. David Peace’s style is extraordinary, bizarre even. It is immensely repetitive: most paragraphs are internally repetitive, in the manner of the one above, and about 75% of the paragraphs are repeated with only minor changes in the book. The surprising thing is that it isn’t more annoying. 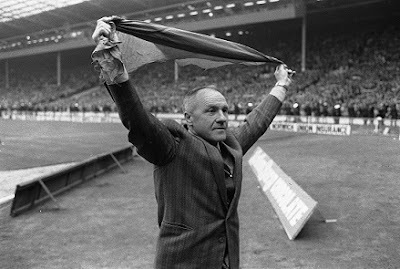 It does have a certain poetry about it, though you are also left gasping by the length of time taken to tell you exactly what Bill Shankly does when he sets the table for breakfast (yes really. And, over and over again). A mean way to put it would be that this is a book for people who want to read about football and can tell themselves this is an intellectual book, literary fiction. But then, it probably is. It’s a novel based on the life of a real person, and has that convincing feel that although there are things that Peace could not have known, overall he got it right. (Though I was surprised that one anecdote – about a game played in fog – wasn’t given its full point: that the two ends sang to each other to find out what was going on - ending up 'Thank You Very Much for the Information' to the tune of the Scaffold hit.) Shankly does become very real over the course of this very, very long book. Orange shirts (as we pointed out in this entry, which nearly contains one) give us a chance to mention Frank O’Hara’s fine poem Having a Coke with you. The book is published today: Faber & Faber gave me a free advance copy. Links on the blog: dressing up in a suit here and here; Gatsby wears a pink suit (perhaps he’d have liked Shankly’s orange shirt and red tie to go with). Moira - That must have been quite an experience reporting Shankly's death. You know, when I read that paragraph, I noticed how repetitive it was. That's the style throughout? And what a story about the fog! It does sound an unusual kind of a book, but I'm always interesting in different looks at real events and people. Very unusual, Margot, but you definitely come out of it feeling you've had a major experience! And I've been thinking about it a lot since I read it, which is always a good sign isn't it? Moira, this looks interesting - I thought he was welded to Yorkshire. I haven't yet plowed through all of Peace's Red Riding Quartet or the latter books, but this is definitely one to keep an eye out for. Tangerine shirts, definitely the 70's. I don't think they would let me out of the house wearing one! I hadn't read anything else by him, and am very interested to know if they are all similar style to Red or Dead, and what people thought about the Yorkshire ones. I love the thought of the tangerine shirt, and also of men who are secretly dandys, while keeping up a rough tough exterior. There's also a mention of Capri cars, very much the cool car for sportsmen of the late 70s and early 80s. My first car was a 1971 Purple Capri, bought for £220 in 1982. Not particularly flash TBH, it came supplied with furry seat covers.....cringe! I have never really been a car person, but I have fond memories of it. One of these years, I will endeavour to return to Peace's books and complete the quartet. He also had a book concerning the miner's strike which I ought to get to. I can recall the early 80's and Thatcher's "reign"
Those of us who lived through the 1980s all have our own admissions to make! I had a few clothes and haircuts that I might prefer to remain forgotten. This sounds interesting but I probably would not read something about that subject. I have been interested in the Red Riding Quartet but not sure. And my husband read Tokyo Year Zero and did not like it. The style of that paragraph is interesting but I don't know if I could take it for an entire book. I know, Tracy, the style is very strange. And I did have a real prior interest in the subject matter, which helped. But now I am tempted to read something else by him.